Luton Town ended their League Two adventure with an thoroughly entertaining goalless draw at a sun-drenched Notts County this afternoon. To their credit, the visitors always looked like the side more likely to finish victorious, even when going a man down, striker Danny Hylton shown his first red card of the season on the hour mark, but try as they might, they just couldn't quite break through. 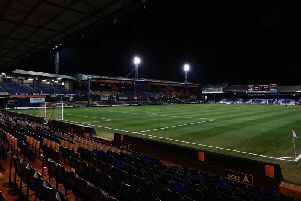 Naming an unchanged side for the fifth game in a row, the Hatters, cheered on by over 4,000 travelling fans, started brightly on what was essentially a free hit, with second place assured, Olly Lee, teed up by brother Elliot, tested Adam Collin from 20 yards, the keeper parrying to safety on 11 minutes. The only slightly blemish in the opening period for the Hatters was a final ball, Elliot Lee twice not picking out a team-mate, James Collins' cross over-hit as well. Hatters should have led on 20 minutes, Elliot Lee releasing Jack Stacey who got round the back of the home defence, but could neither pick out the bottom corner or the lurking Collins and Hylton as the chance went begging. Stacey made amends with a fine block at full stretch on Jon Stead, with Jorge Grant's long ranger comfortable for James Shea. Town's right back was swiftly involved at the other end again, bursting into the box and shifting on to his left foot, only denied an opener by a desperate last-ditch challenge. Elliot Lee's fierce drive flew over via a County defender, while with the ole's coming out as Town worked the ball upfield, Collins crossed for Hylton to turn into the side-netting. Luton should have been awarded a spot-kick on 35 minutes, Olly Lee hauled back after getting the better of Shaun Brisley, only for official Darren Handley to wave his appeals away. Handley was involved once more just before the break, as with a drop ball waiting to take place, he cautioned Hylton for what looked like a show of dissent. In the second period, Town got away once more on the counter, but despite Hylton taking up a superb position, Elliot Lee tried to thread Collins through, and when he got the ball back, missed the target. He then went closer from Sheehan's free kick that caused havoc, firing in a volley that Collin blocked with his legs, before from further out, missed the top corner by a matter of inches from 25 yards. With 59 minutes gone though, Luton were reduced to 10 men as Hylton went up for an aerial challenge with Brisley, catching his opponent in the face, official Handley reaching for his pocket to give Town's leading scorer his marching orders, ruling him out of the opening game in League One. Despite the numerical disadvantage, Town still took the attack to their hosts, Mpanzu and Collins combining to set Stacey away on the right as once more he missed the bottom corner. County struggled to get a head of steam going at any stage, Jonathan Forte's header glancing wide, as Luton kept pressing, happy to commit men forward and at times looking like they had the extra player. Stacey once again reached the byline, his delivery only just in front of the diving Harry Cornick, who had replaced Elliot Lee, while after Olly Lee's dummy, Collins laid in Mpanzu, Matt Tootle making a brilliant block. Glen Rea's header drifted wide, with the Magpies only threats coming from set-plays, Grant's free kick almost swinging straight in. Late on, Town had the chance of the game, Rea's long punt sent Collins clear, but bearing down on Collin, his touch let him down badly, the ball bouncing off his knee and straight through to a grateful Collin. In stoppage time, Grant put a free kick over from the edge of the box and Alan McCormack's 25-yarder didn't test Collin, as both sides had to make do with a point, with County now hoping they will join Town in the third tier of English football via the upcoming play-offs. County: Adam Collin, Matt Tootle, Elliot Hewitt, Matty Virtue (Lewis Alessandra 73), Michael O'Connor (C Noor Husin 73), Jorge Grant, Jonathan Forte, Shaun Brisley, Dan Jones, Ben Hall, Jon Stead (Alan Smith 80). Subs not used: Ross Fitzsimons, Richard Duffy, Shola Ameobi, Rob Milson. Hatters: James Shea, Jack Stacey, Dan Potts, Glen Rea, Alan Sheehan (C), Alan McCormack (Flynn Downes 90), Pelly-Ruddock Mpanzu, Olly Lee, Elliot Lee (Harry Cornick 79), Danny Hylton, James Collins. Subs not used: Marek Stech, James Justin, Luke Gambin, Jake Jervis, Scott Cuthbert. Booked: Hylton 45, Jones 65, Forte 72, Hall 80, Sheehan 90. Hatters MOM: Jack Stacey. Defended excellently but was also one of Town's mains threats going forward.